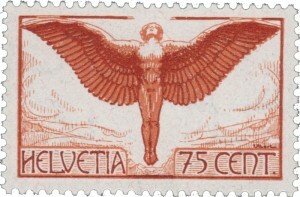 The nations of Europe were among the first countries to issue stamps in the mid to late 1840’s. 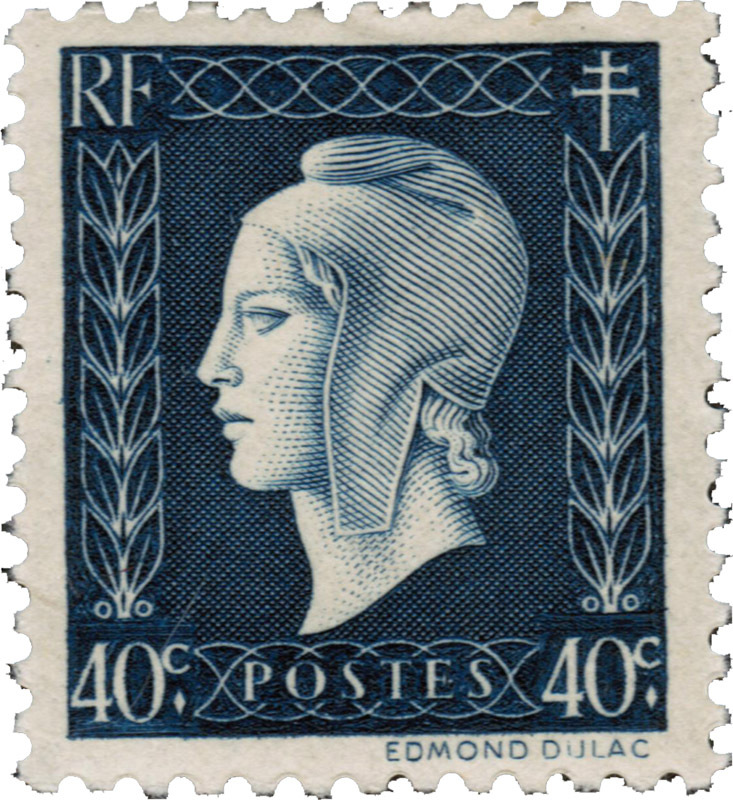 At the time, they were the industrialized nations of the world, many with extensive colonial holdings around the globe and have issued numerous postage stamps depicting a widely varied history covering everything from royalty, major events to domestic scenery, economies and charitable causes. The Scandinavian portion of Northern Europe is mainly made up of the Scandinavian Peninsula. It includes the countries of Norway, Sweden, Denmark, Finland and Aland as well as Iceland and Greenland. 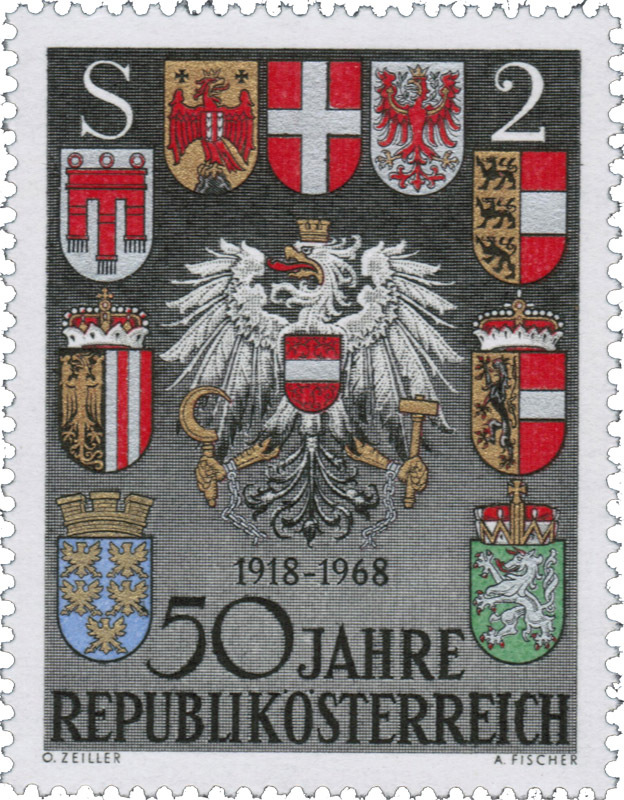 The issue of postage stamps in Austria began in June with a series of five stamps depicting the Austro-Hungarian coat of arms. These were superseded by issues bearing the profile of Emperor Franz Josef including a 1908 issue depicting members of his royal family and the 1910 80th birthday issue of the Emperor. A brief experiment 1901 with overprinted varnish bars was conducted in an attempt to prevent reuse of stamps. 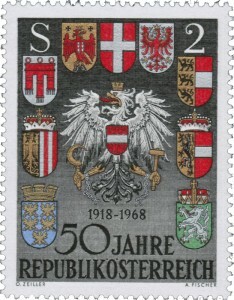 Beginning in the 1940’s Austria has maintained a world wide reputation for issuing beautifully engraved stamps of both commemorative and regular issue types. It is also a prolific issuer of Semi-Postal stamps, used to raise money for charities. The history of Denmark’s postal service started on 24 December 1624 when King Christian IV established a national postal service. The postal service initially consisted of 9 main routes and was conducted by the mayor of Copenhagen along with several guilds. At first the mail was carried by walkers but horse riders were used after 1640. 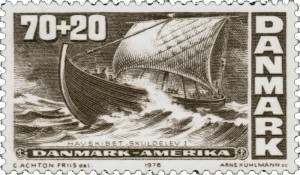 The postal service was handed over to Paul Klingenberg on 16 July 1653. He introduced a number of systems to modernize the service, including the use of mail coaches to carry parcels. Klingenberg was responsible for the service up until 14 March 1685, when he handed control over to Count Christian Gyldenløve. The Gyldenløve family continued in control until 1711 although new routes and rates were established in 1694. The first Danish postage stamps were issued in 1851 depicting a crown, scepter and sword. The first Denmark commemorative stamp with a picture of the Copenhagen General Post Office was issued in 1912. In modern days, Denmark postage stamps depict Queen Margrethe II plus many colorful commemorative designs covering art, nature, ships, architecture and many more fascinating subjects. It is worthy of note that the numeral with waves stamp issue of 1905 continues to be updated with new values even in the 2010’s. 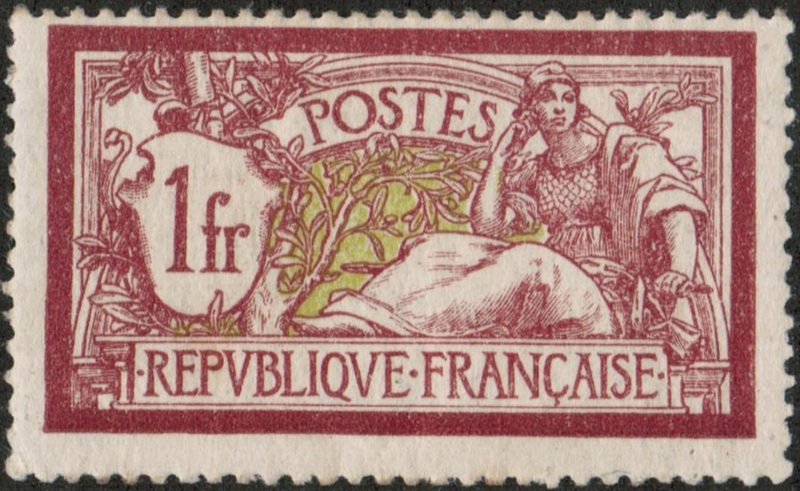 The first stamps were issued in France on January 1st, 1849 depicting Ceres and was then followed by stamp issues bearing the likeness of Napoleon III. In 1876 the Peace and Commerce stamps were issued and remained in usage for almost thirty years. France established its reputation for fine philatelic design, engraving, layout and ink colors beginning with the issues of the 1920’s and has successfully maintained this reputation to today. 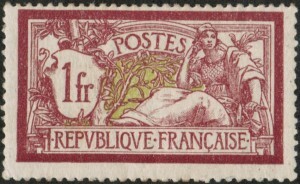 France is also noted for having produced numerous semi-postal stamps with a charitable surcharge to help worthy causes. These sets of stamps often are of the finest quality of stamp production anywhere in the world. 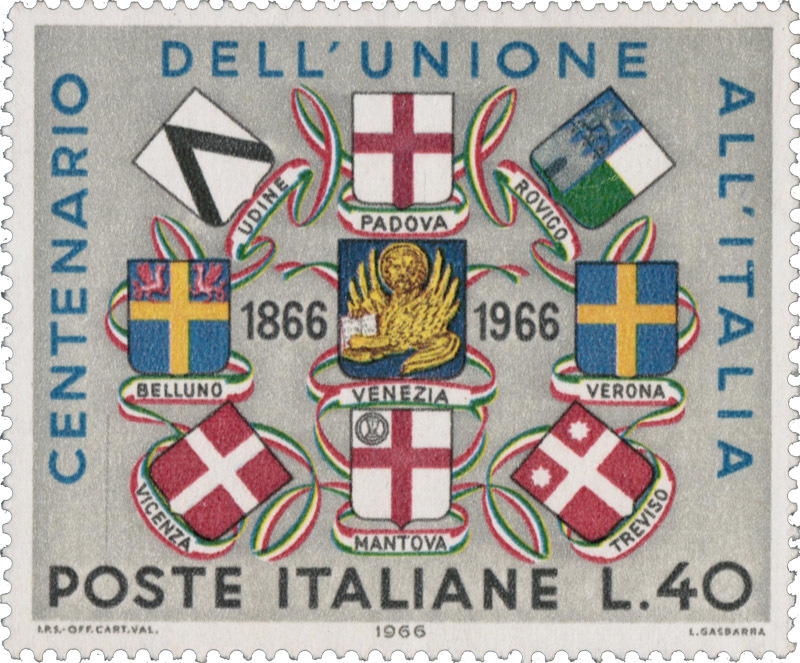 Until its unification in 1861 Italy’s postal history was irrevocably tied to its kingdoms and realms which ruled in the Italian peninsula at the time. 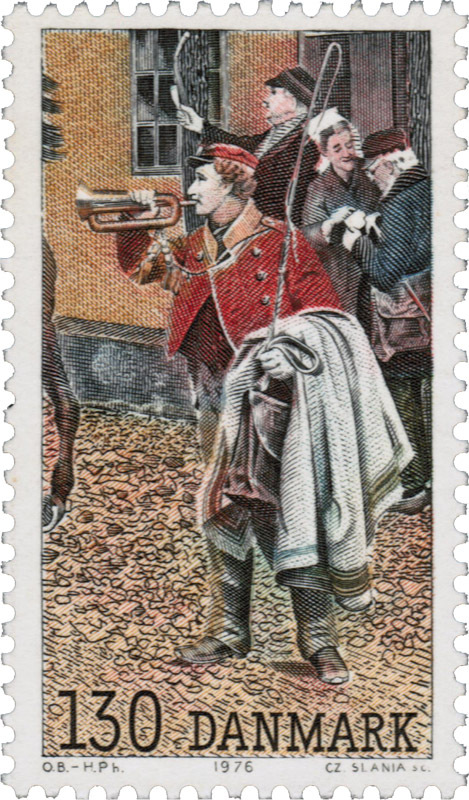 Sardinia was responsible for a small private mail service which became known as The Cavallini, (little horses,) and introduced prepaid letter stamp sheets in 1819. 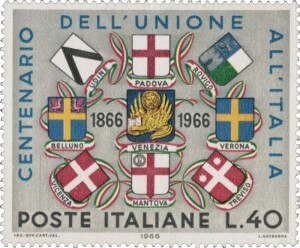 The new Italian government had to create a new word for ‘postage stamp,’ which became known as ‘francobollo.’ The first true Italy postage stamp was issued in 1862 and is very similar to the Sardinia issues that it replaced. 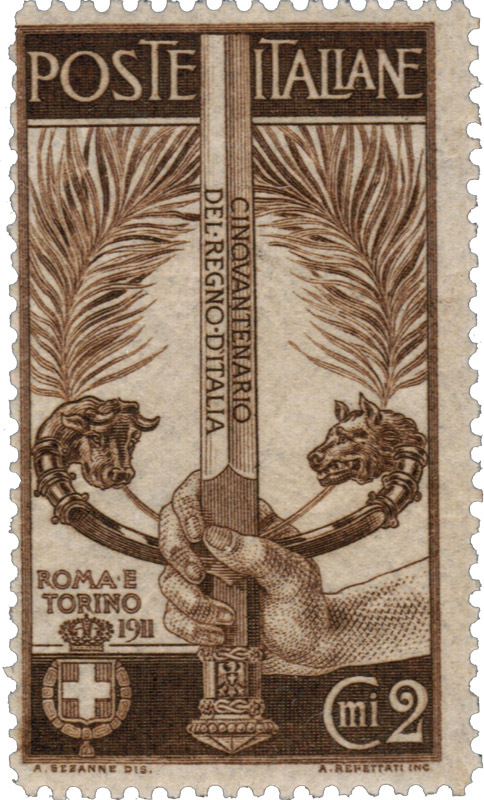 Early Italy postage stamps are notorious for there bad centering with perforations almost always cutting into the design of the stamp. 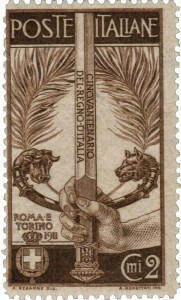 Over the years Italy has issued many fine, long sets of postage stamps including the Worker set of 1950, the Italia set of 1953, the Tourism series of 1974 and the Castle set of 1980. The monarchy of Spain issued its first postage stamps on 1 January 1850 which depicted Queen Isabella II. 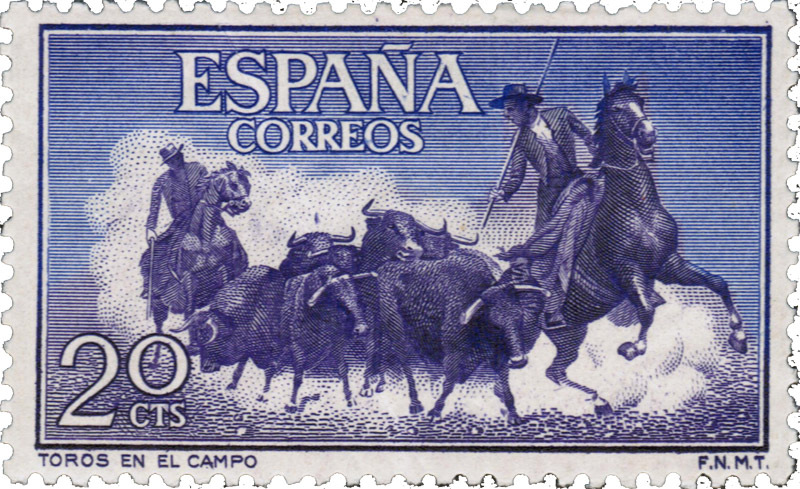 Despite political upheaval, the monarchy, then thr Duke de la Torre Regency, then the republic, continued to issue stamps until peaceful unification under King Alfonso XII in 1875. Some of the better known early Spanish commemorative sets include the Seville and Barcelona Exhibition set of 1929, the Francisco de Goya set of 1930 and the Christopher Columbus tribute set also issued in 1930. It is worth noting that the Goya set included the three famous “La Maja Desnuda” stamps which created a huge furor throughout Europe. 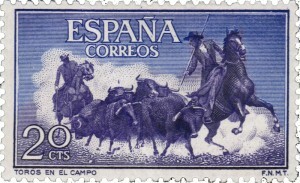 Spain has issued many eye catching sets of castles, religous themes, sailing ships, regional costumes, city crests and fine art including a really nice set of stamps depicting matadors and bulls issued in 1960. The Swedish mail service, known as Posten was established in 1636 by Axel Oxenstierna. By the 18th century, Posten had been extended throughout the country. 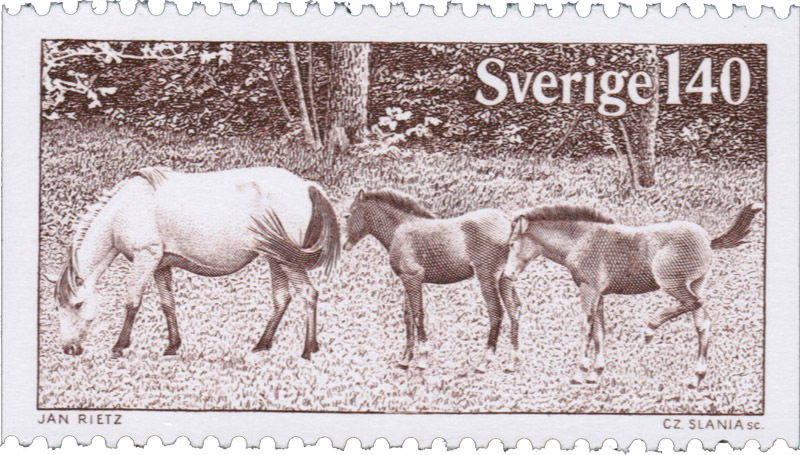 The first postage stamps were issued in Sweden on 1 July 1855, and were a set of five values which were denominated in ‘Skilling Banco’. 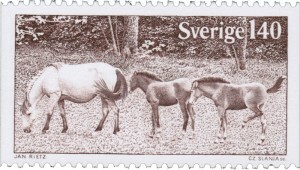 These stamps bore the Swedish coat of arms, were inscribed with the word “SVERIGE”, and were perforated. A printing error resulted in the ‘Tre Skilling Yellow’, a unique stamp that is currently the highest-priced stamp in the world valued at about three million dollars (if you can find one). 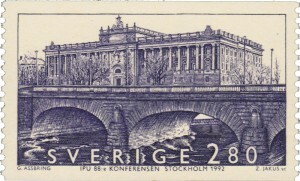 Swedish postage stamps from the 1870s to 1920s are relatively mundane except for watermark and perforation varieties even though the booklet panes are hard to find. 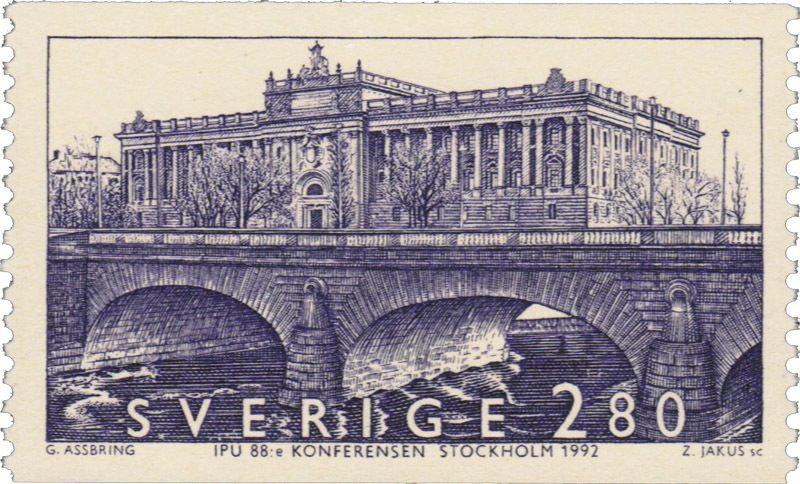 In 1924 Sweden issued two long commemorative sets of postage stamps honoring the Universal Postal Union followed in 1936 by a long set commemorating the 300th anniversary of the Swedish Postal System. In later years Sweden has issued annual sets of postage stamps honoring Nobel Prize winners. In addition they have depicted subjects such as architecture and design, shipbuilding, viking history, flora and fauna, even pastries and chocolates. 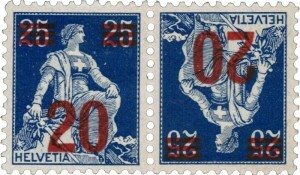 Switzerland’s first stamps were issued by the member Cantons of Zurich, Geneva and Basel and were for their own use. The ‘Zurich 4 and 6’ stamp was issued for sale on 1 March 1843. This meant it was the second stamp in the world following the lead of the UK’s Penny Black three years earlier. 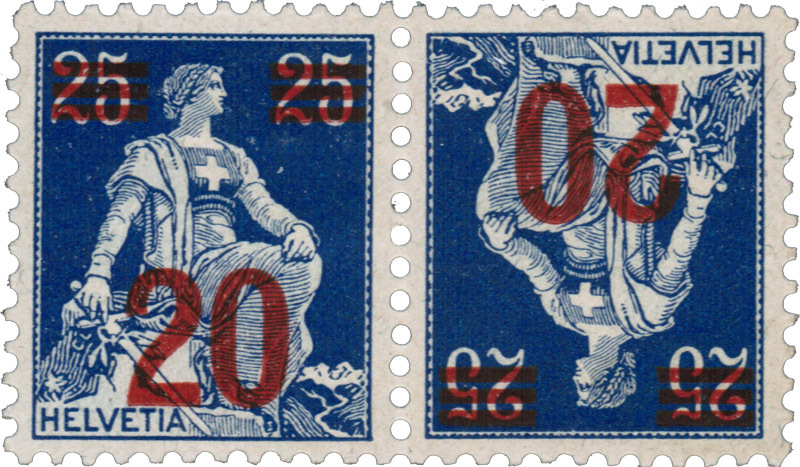 The first federal administration stamp issue of Switzerland appeared in 1850 in two versions. One was in German “Orts Post” and the other was in Italian “Poste Locale”. 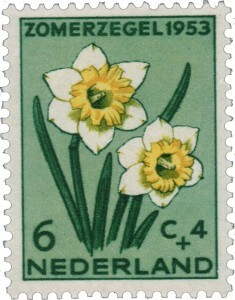 These were soon replaced with similar appearing stamps but the word “Rayon”. 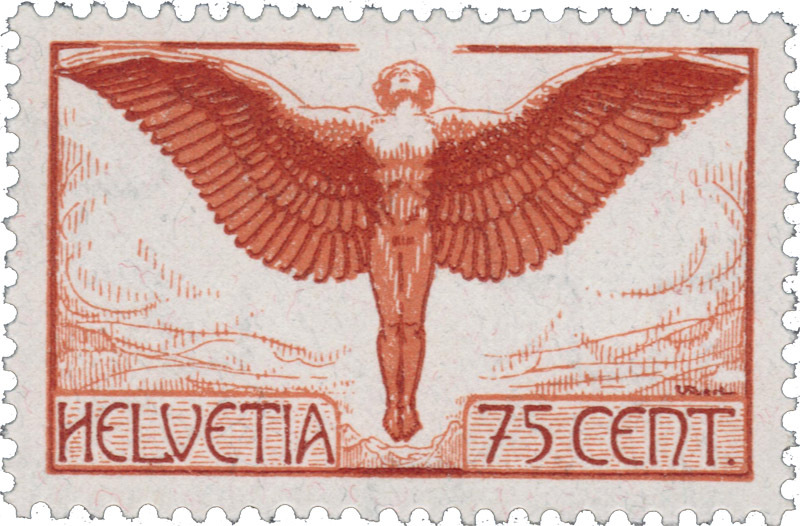 In 1854, the first seated Helvetia stamps were issued and continued in various design versions into the 1920s. 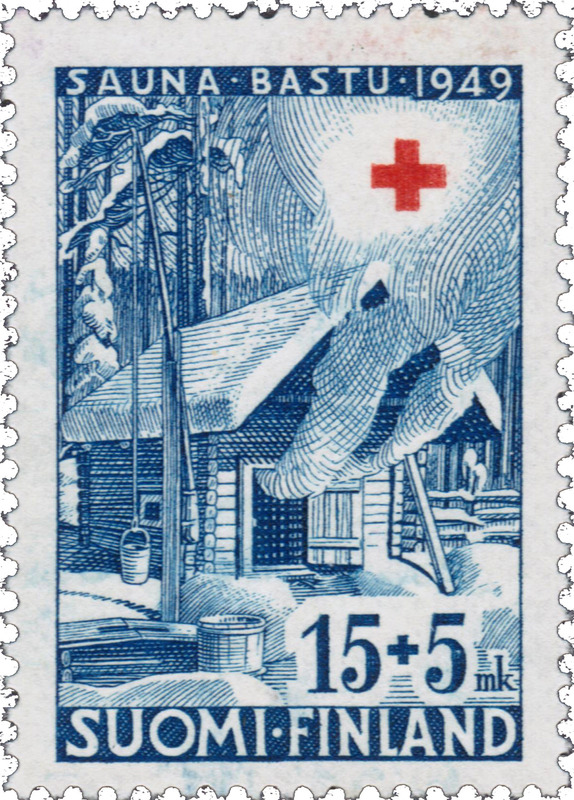 Switzerland has pursued a policy of only issuing a few sets of stamps each year, however they do add to the commemorative issues by maintaining a strong production of Semi-Postal stamps issued for charitable purposes. 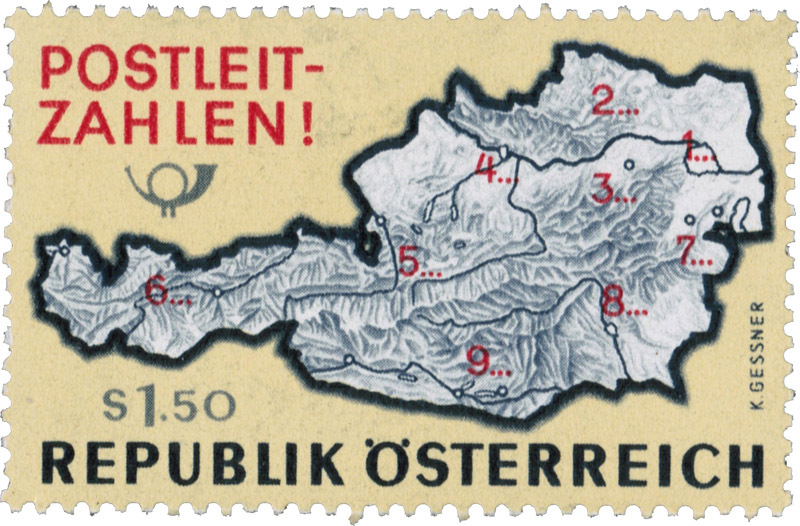 In addition to the regular Swiss stamp issues, there also many stamps issued by various United Nations agencies located within the country.